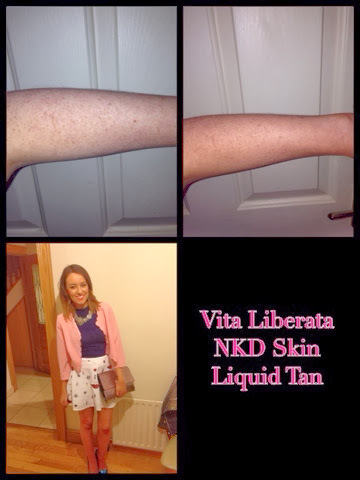 Alongcamepollly: Vita Liberata NKD Skin tanning range Review! Hello there, no, your eyes do not deceive you, I have written an ACTUAL blog post....I want to apologise for my complete lack of proper posts I have been so so busy and to be honest totally lazy, but Lent beings tomorrow and regular blogging is one thing I will improve on! The lovely people at Vita Liberata sent me a bottle of tan from their latest range the NKD Skin tan. The idea behind this is that you still get the great Vita quality but at a much more affordable price. This is being marketing for younger girls who want to look like bronzed beauties without it breaking the bank. The one I tired was the Tinted Liquid Tan in Dark. It's a 75ml bottle and costs around €10 which is INCREDIBLE for Vita which is my favourite tan anyway! It's a liquid spray, therefore easy to apply.i had exfoliated and moisturised the night before because I wanted the tan to come out perfect and last longer. The colour comes up instantly and dries in seconds, there is no smell at all, and it doesn't even feel like you have anything on your skin. The next morning I woke up REALLY TANNED so I was eager to shower it off-some tans don't require that you wash them off, but with this I would- I had to wash my hair so the shampoo probably took off a bit more tan than I wanted so be careful of this. I would recommend to have your hair washed already so in the morning you are literally having a warm shower and gently rinsing off the tan excess with your hands. No tan came off on the towel when I was drying and I had such a gorgeous deep glow to my skin. I put the tan on Friday night and having showered daily -I swear- my skin still has a slight colour with no streaking at all. It's no secret the love I have for Vita Liberata tan, but I know I'll love this range also. I used the dark, if you are pale maybe go for the medium as the dark may be too deep. There are lots of other tans in the range including a mousse and a wash off instant tan all for under €20. They are due in shops soon so I'll let he know when we get them at work!